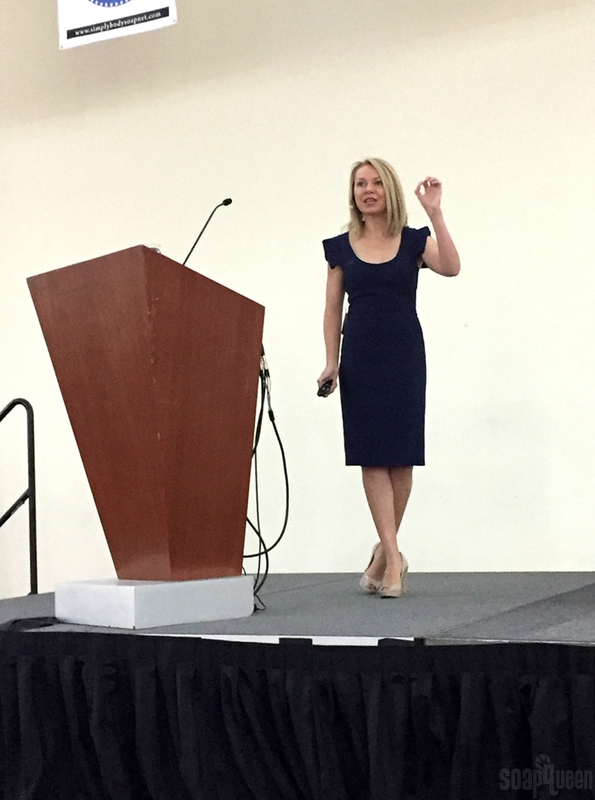 In 2015, Julie with Soaperie + Co. left her job in finance to spend more time with her kids. 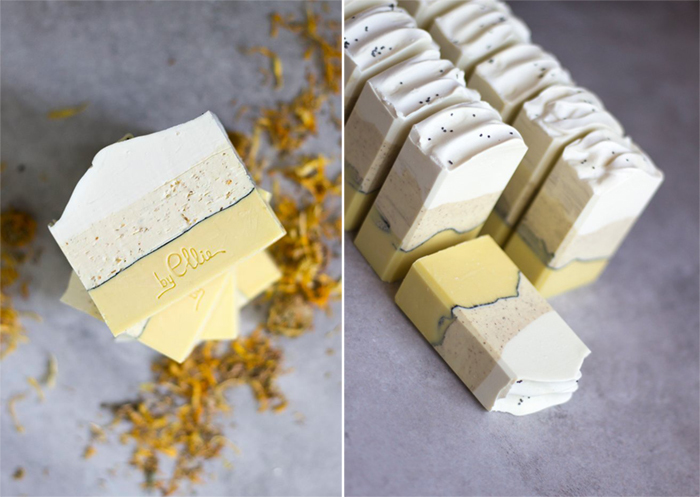 She started exploring creative outlets and discovered a love for soapmaking. 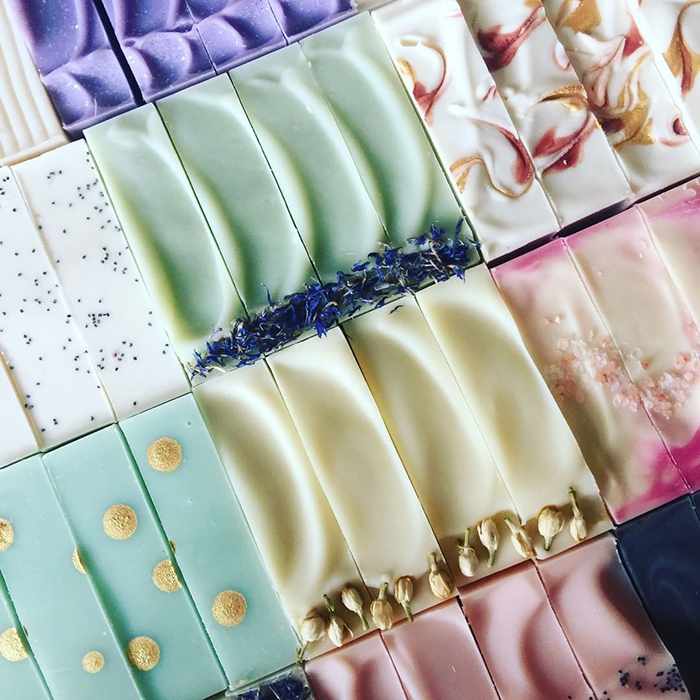 Now she makes and sells beautiful cold process soap, lotion bars, candles, and more. 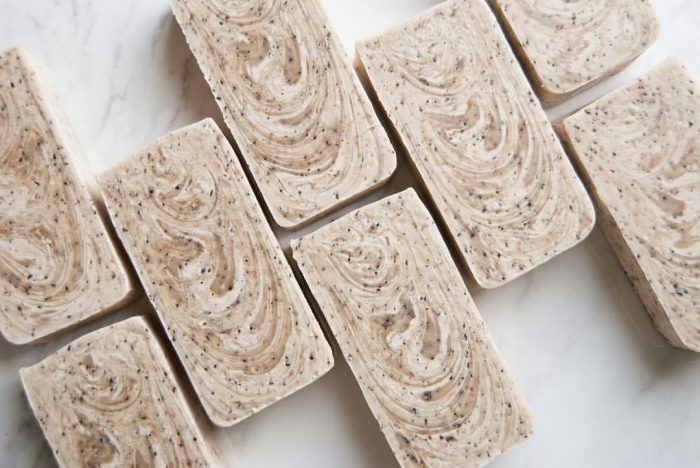 Learn more about how Julie got started, what inspires her, and her soapmaking tips. 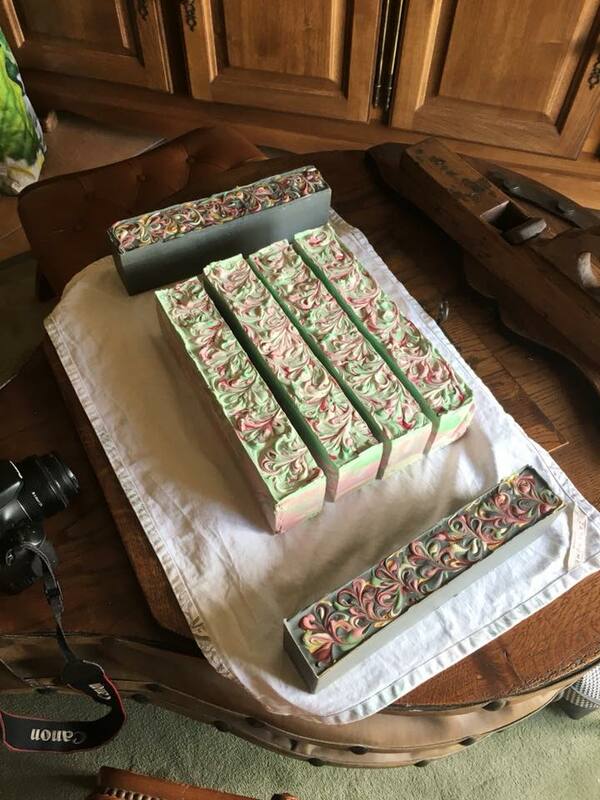 I’ve been making soap for almost two years and I’ve enjoyed every minute of it! 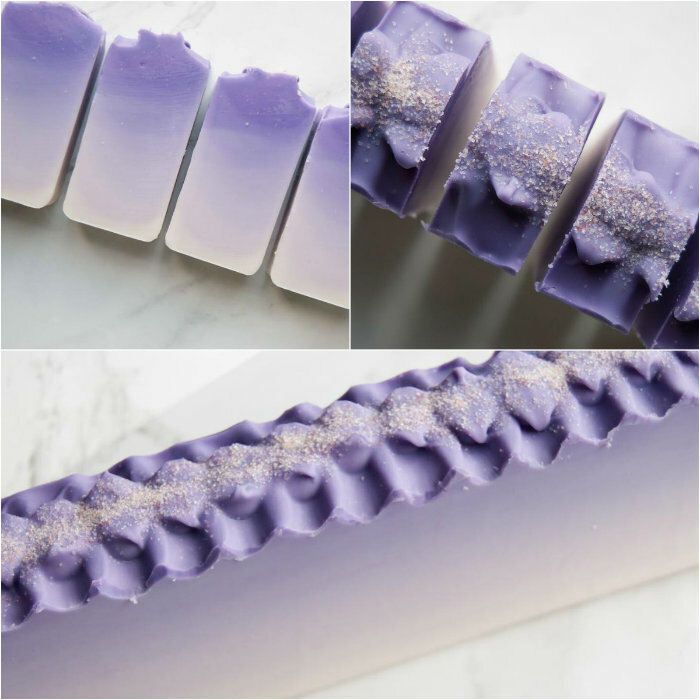 The very first soap I made was the Relaxing Lavender soap from Bramble Berry’s Natural Soap Kit for Beginners. 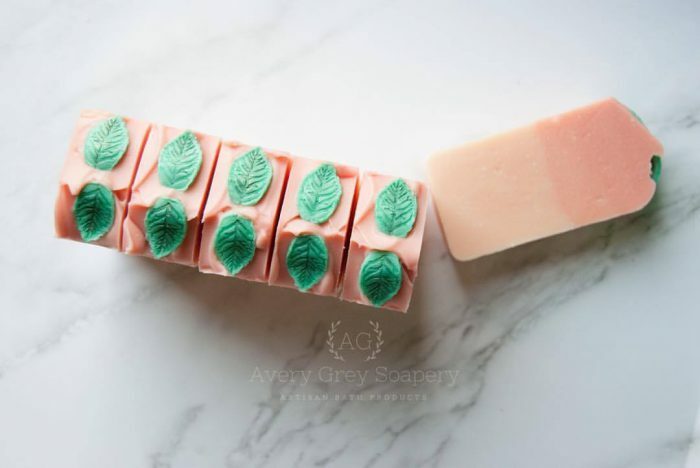 It was such a great way to start creating handmade soap because the kit comes with everything you need. I remember checking in on the soap as it cured and after a couple of hours, I noticed a crack on the top of the soap. In hindsight, I realized that I was just too impatient and I didn’t let my lye water cool enough before I mixed it with the oils, so the soap got way too hot. 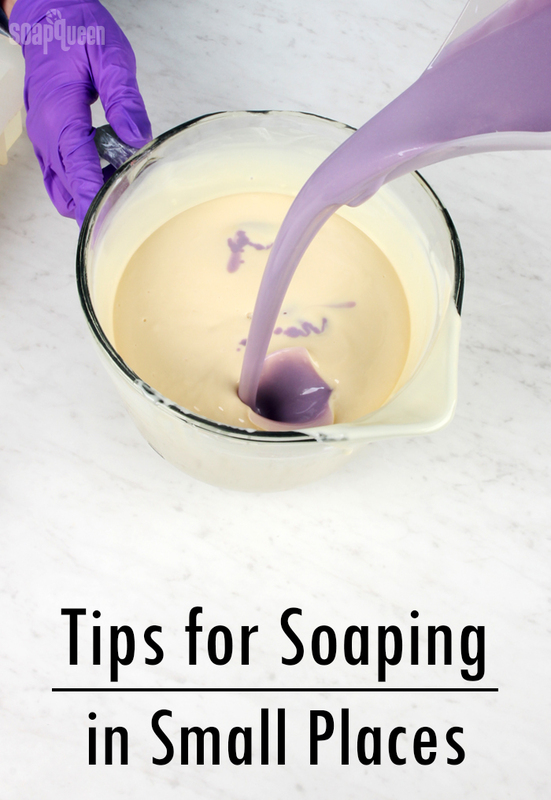 I’ve learned a lot since then, but I think that soapmaking experience is still one of the most exciting! 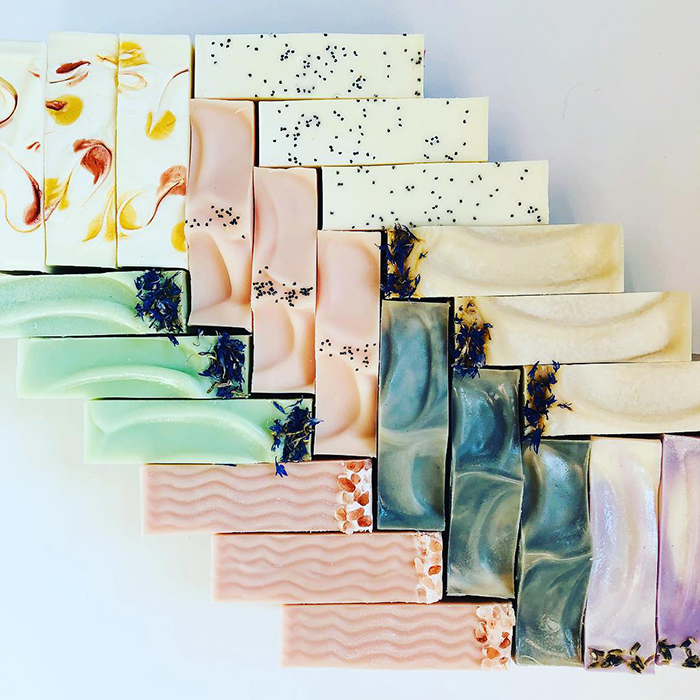 Soaperie + Co. really got started as a second act in life after I’d spent more than 20 years in a more traditional career. In 2015, I left my job in finance to spend more time with my kids and to focus on enjoying a slower pace of life. That first year after I stopped working absolutely flew by because I was busy helping my older son apply for college. 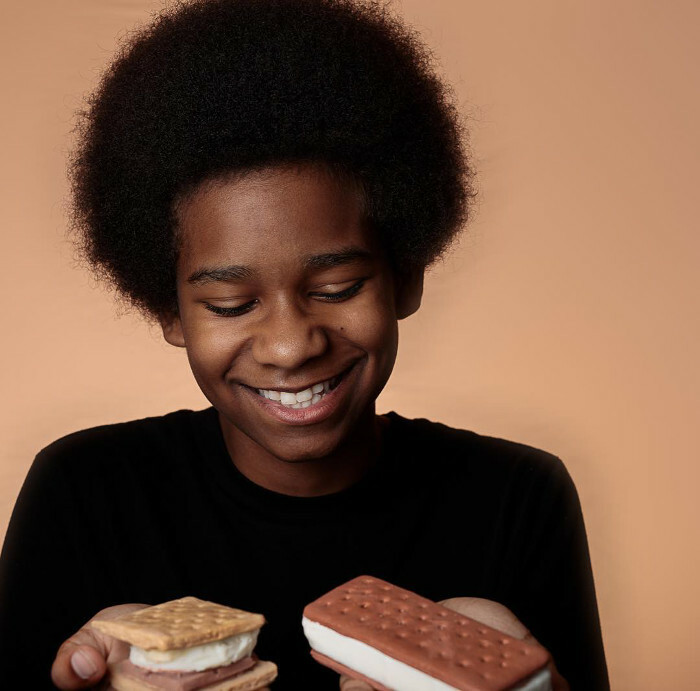 Eventually, he left home to start school and that’s when I knew I needed something to keep myself occupied. I’ve always loved fashion and interior design, so it wasn’t a surprise that I began to explore my creative side. 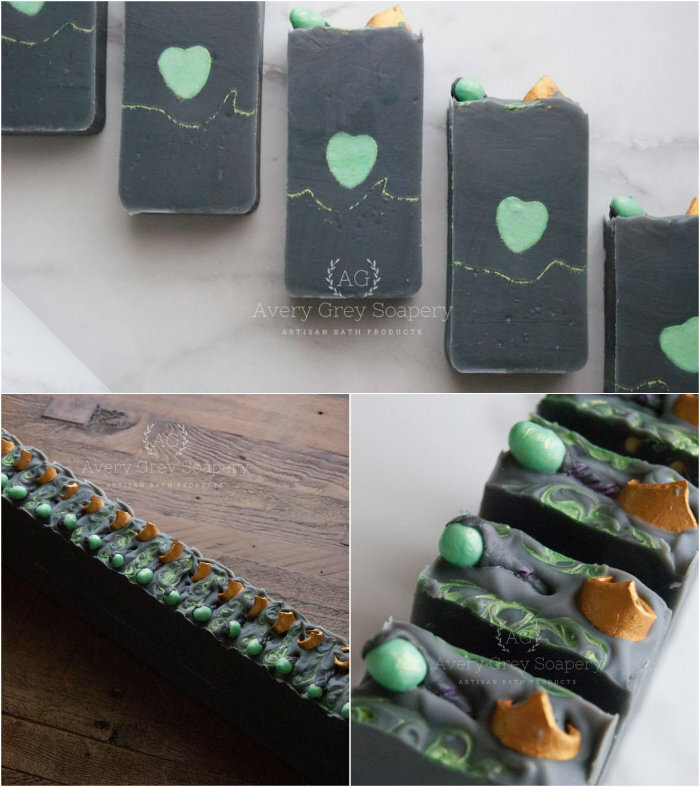 To me, making artisan soap is the perfect blend of creative and analytical, just like me. I loved it instantly. Fashion, interior design, cooking, and nature. Right now, I’m watching the latest season of the Great British Baking Show. I’m mesmerized by the unique ingredient combinations that go into the contestants’ truly amazing creations. 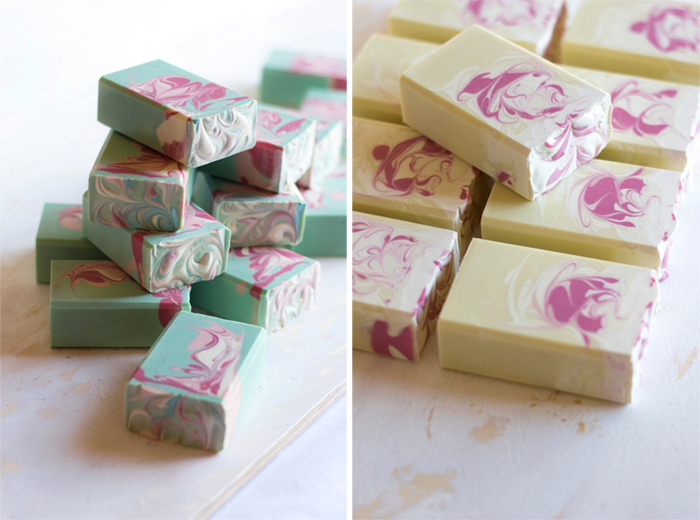 Soapmaking has a lot of similarities to the cooking/baking world and you tend to see a lot of the same trends. I like to use what I’ve seen for inspiration. What advice would you give to makers just starting their businesses? 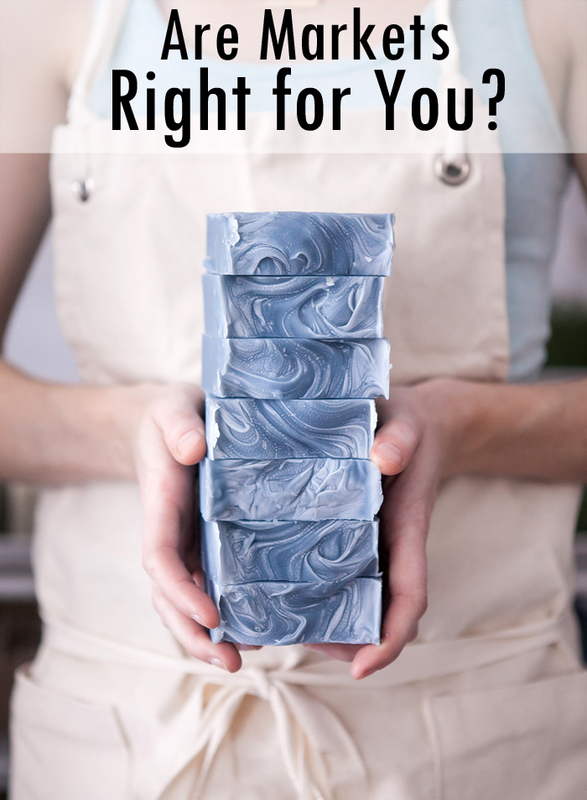 Be patient, take it slowly, and learn everything you possibly can from more experienced soapmakers. I’m not a patient person by nature and I really jumped into this business quickly. There have been times that I’ve definitely learned “on the job” and that kind of learning can be difficult. I wish I knew early on what I know now. I think if I’d been a little more patient, there would have been fewer growing pains. One of the biggest mistakes I made was being afraid to say no. 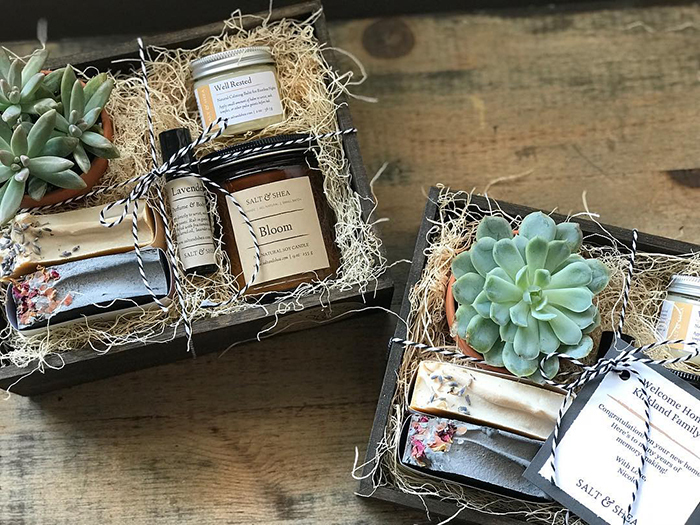 Whether it’s a wholesale order that just wasn’t profitable or a time-consuming project for a friend, it’s easy to feel obligated to do something that really isn’t a good use of your time. When you have the courage to say no, it’s a really powerful thing. It opens you up to have the time to pursue the things that you really want to do. 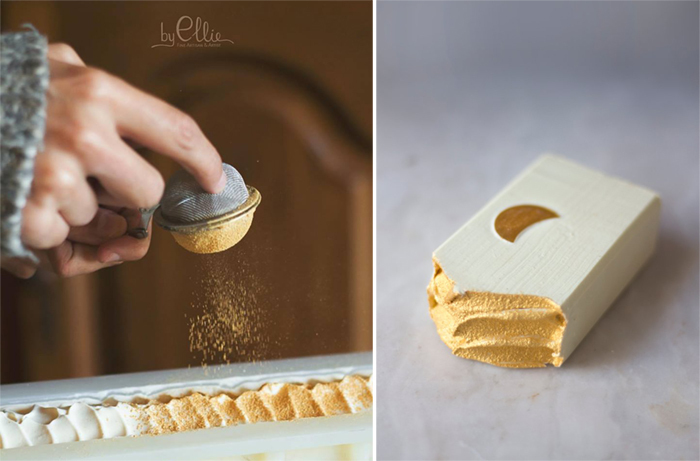 Cold process soap. There’s something so beautiful about the perceived simplicity, yet it really can keep you on your toes. It’s different every time you make it, even when you’re remaking something you’ve made before. The air humidity, the temperature of the ingredients, and the type of fragrance oil – it makes it impossible to control the outcome with exact precision. Learning to deal with unexpected problems is just part of the process! Naming your business is so incredibly personal. At the end of the day, I wanted a name that would convey my sense of style…simple, sophisticated, feminine, and professional. I also wanted to make sure it reflected that it’s a soap business. Instead of just using the word soapery, I tweaked it a little and made it “Soaperie” to add some flair. 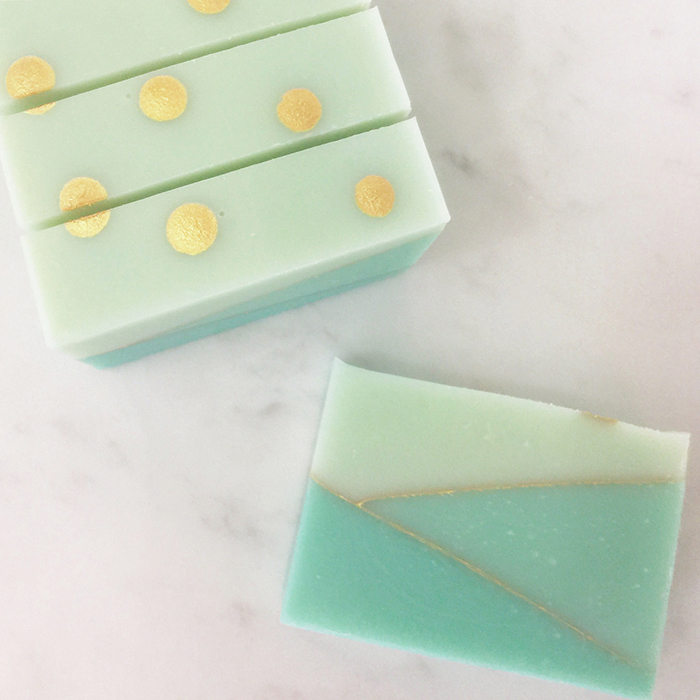 There’s a funny story about the name Soaperie + Co. Recently, it dawned on me that people may read it as “Soap Erie,” as in soap made in Erie, PA. 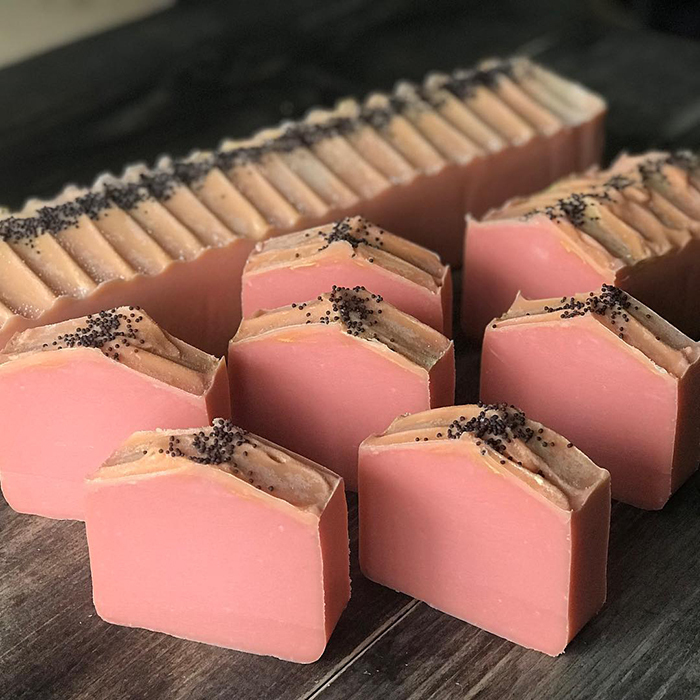 Someone commented on an Instagram post that they would love to have a bar of my soap because they’re from Erie and they’re feeling homesick since they moved away. I didn’t have the heart to tell them that sadly, there is no connection to Erie. I still love the name of my business, but this was a good reminder about how important it is to really think through your business name before committing. It’s impossible to choose just one. 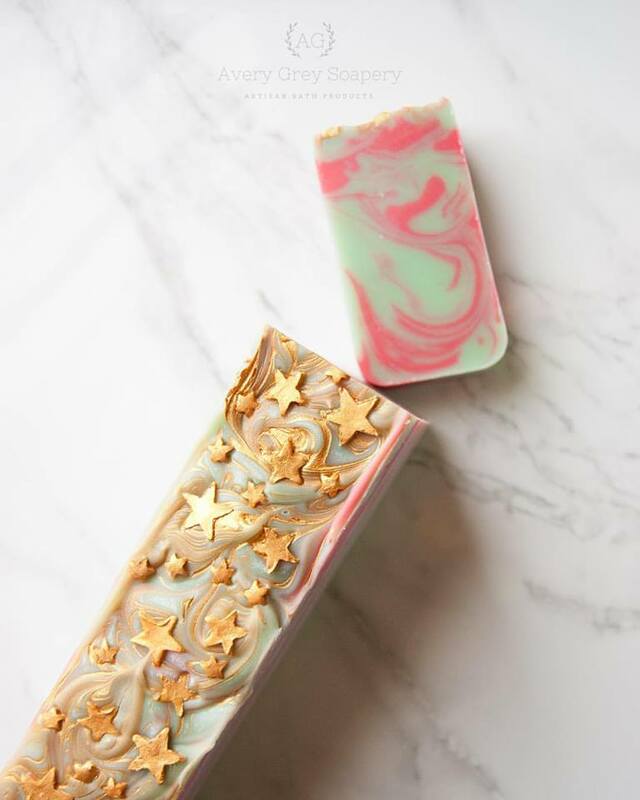 The Copper Sparkle Mica and Gold Sparkle Mica are both so incredibly beautiful, so much fun to use, and really give your soap a glamorous feel. 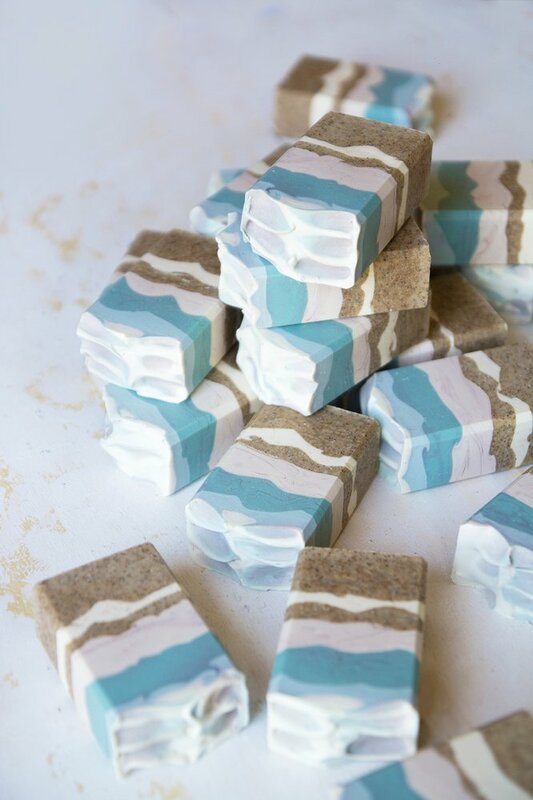 I love to use them as mica lines in between soap layers or mix them with sweet almond oil and create a sparkly design on the top of the finished soap. 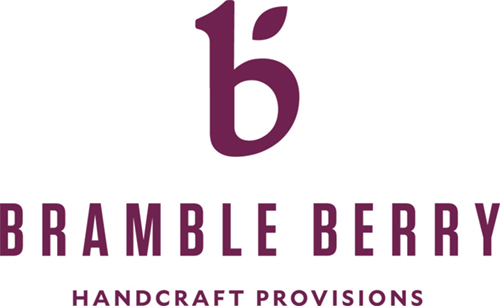 There are also so many amazing Bramble Berry fragrance oils. I honestly couldn’t live without Cocoa Butter Cashmere, Autumn Fig Harvest, Rose Quartz, and Tobacco and Bay Leaf. If you haven’t tried them, you’re missing out! I’m originally from California and I graduated from UCLA with a BS in Mathematics. I’m also a CPA. 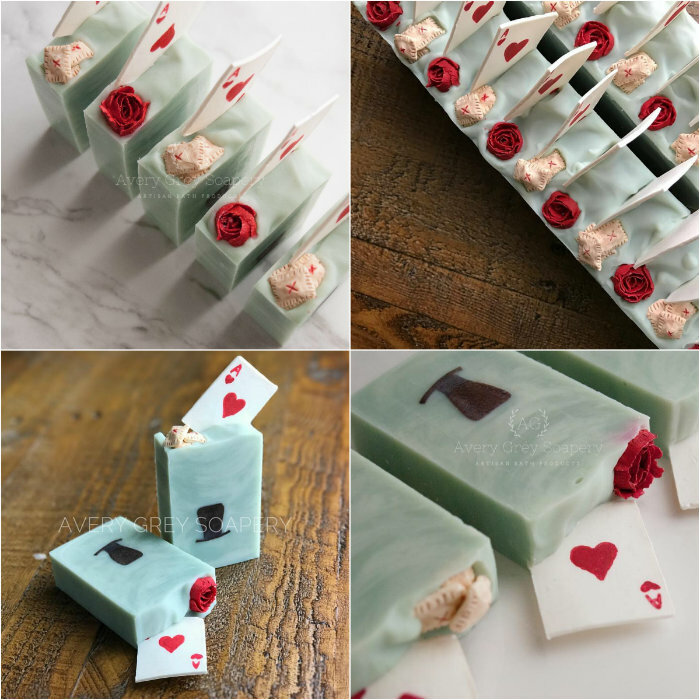 It’s probably not the typical resume of a soapmaker, but I have found that analytical and problem-solving skills can be very helpful in this business. 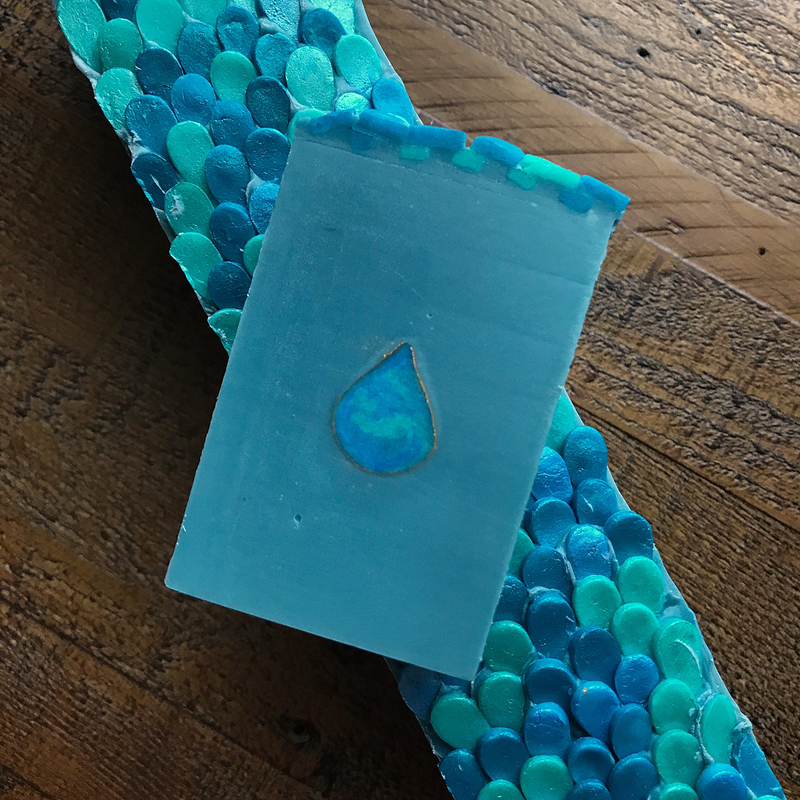 No matter what your background is, I think you bring your own unique perspective to soapmaking. 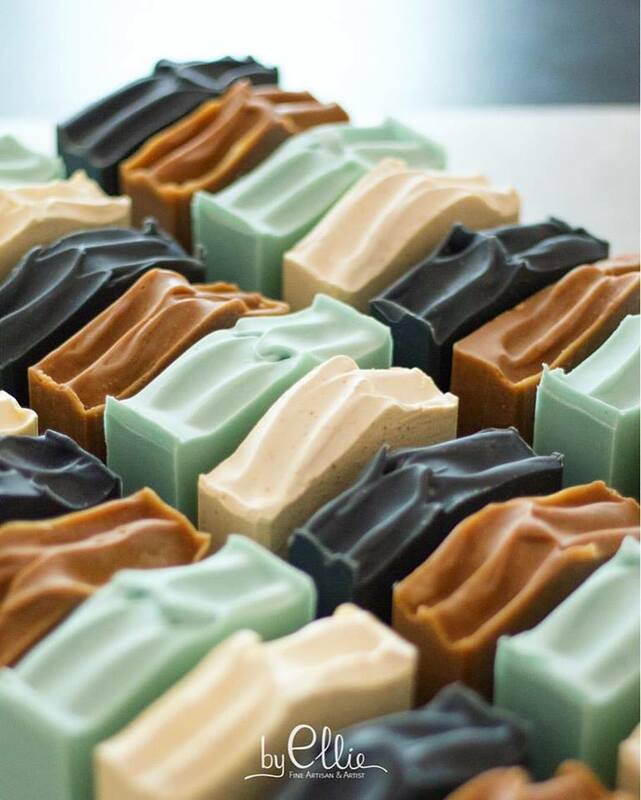 One of my favorite things to see on Instagram is a photo of a soap that’s different than anything I’ve seen before. Right now, I’m trying to learn everything I can about photography. 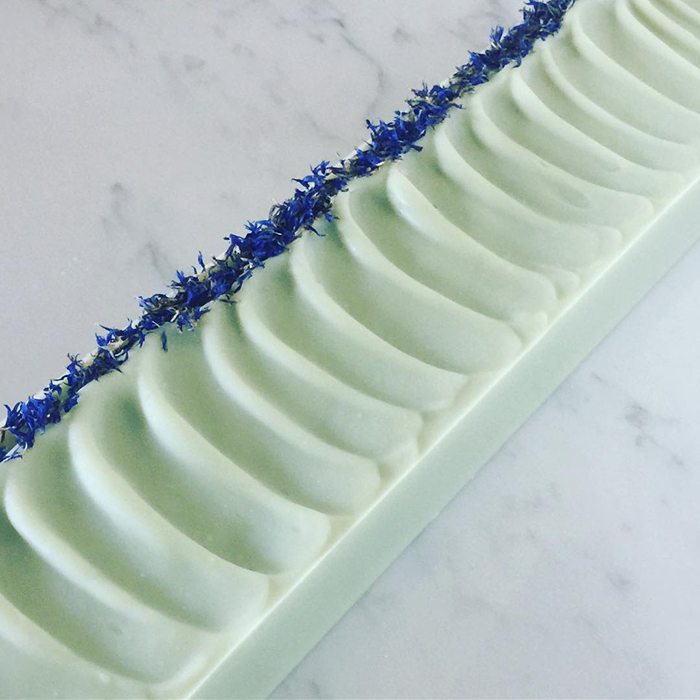 When I first started posting photos of my soap on social media, it was a disaster. I even had a professional photographer leave a comment on one of my Instagram posts suggesting I contact her for help. I still have a long way to go, but thankfully my photos have improved since then. Someday, I would love to graduate from my iPhone to a good digital camera. I also love spending time with my family, playing fantasy football, watching good movies, watching bad reality television, reading, enjoying great food, baking, and traveling. Of course, there are so many fails that it’s difficult to choose just one. Once, I dropped my soap batter on the floor. I accidentally left my immersion blender sitting in the soap batter. I was using a plastic bucket for the first time (I had been using a glass container) and the blender was just too heavy for the container to support. When I let go, the entire bucket of soap spilled down the front of my cabinets and all over the floor! Luckily, I got it cleaned up quickly and no one was hurt. If I learned anything from this fail, it’s just another reminder that soapmaking can be dangerous and it’s so important to be careful. Each time I introduce something new into the process, now I try to think ahead and assess the impact before a mistake happens. 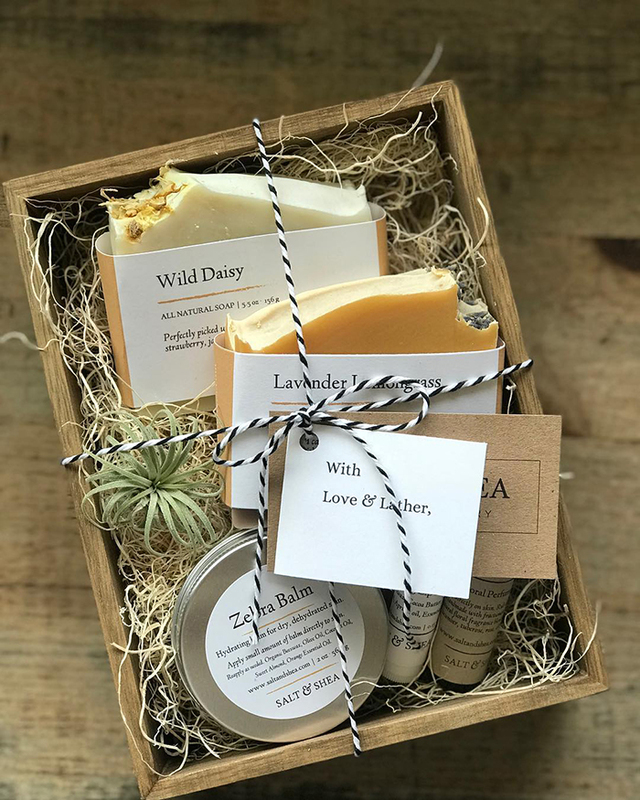 Right now, since it’s getting cooler and we all start struggling with dry skin, I would give them a Beeswax + Honey lotion bar. 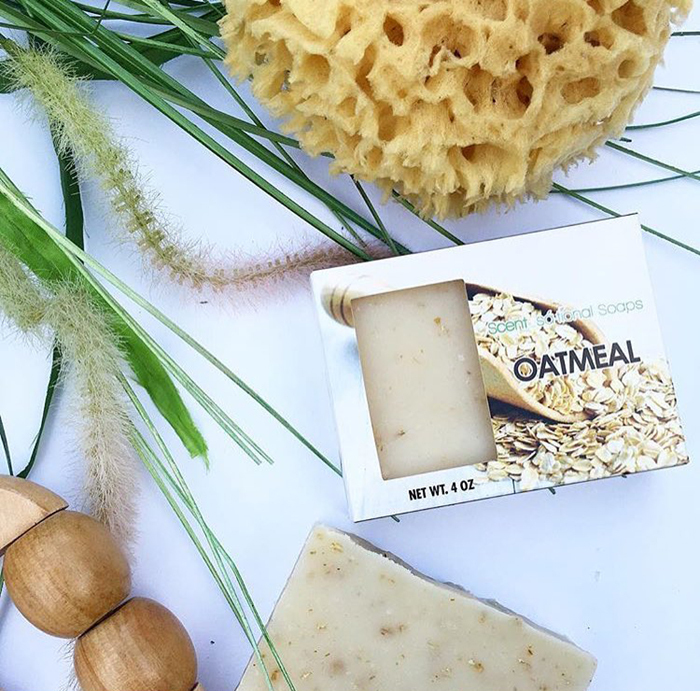 It’s made with beeswax, shea butter, and olive oil and it’s so incredibly moisturizing (and it smells great, too). They come in a small recyclable container that’s easy to throw in your purse and take with you on the go. One of my favorite stories about our lotion bars is from a customer who sells handmade knitted items. 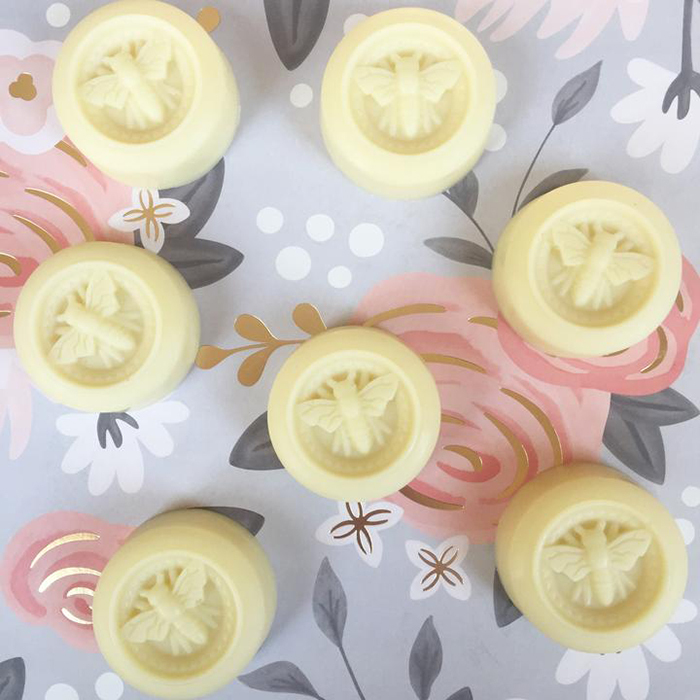 She likes to use our lotion bars on her hands before she starts knitting a project and says it makes the yarn smell so good. She’s even received feedback about the wonderful fragrance from her customers! 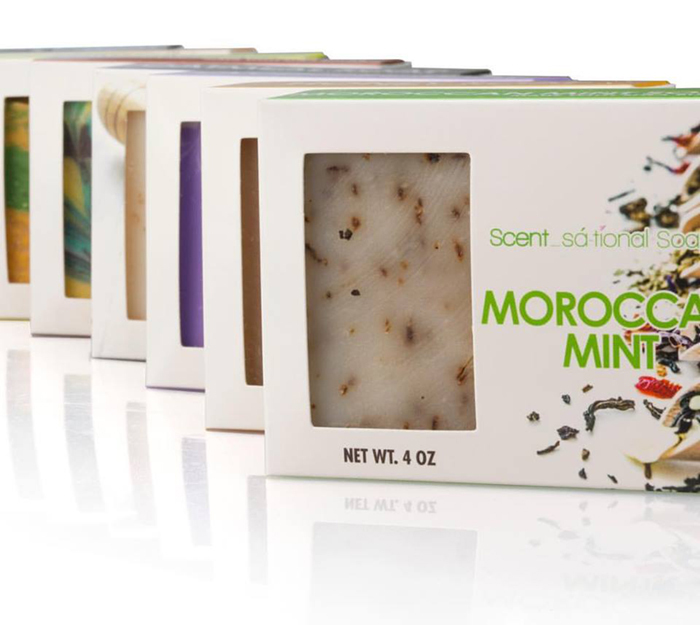 Try soaping at room temperature. For the longest time, I wouldn’t even consider trying it and I would spend countless hours trying to get my oils and lye water to within 10 degrees of each other. At higher temperatures, this can be time consuming. Soaping at room temperature has worked out well for me because Austin is a pretty hot and humid part of the country, so most of the time all my oils are already liquid at room temperature. In the winter I do have to heat up some of the harder oils. For me, it really simplified my life and I don’t spend so much time worrying about timing everything so carefully! 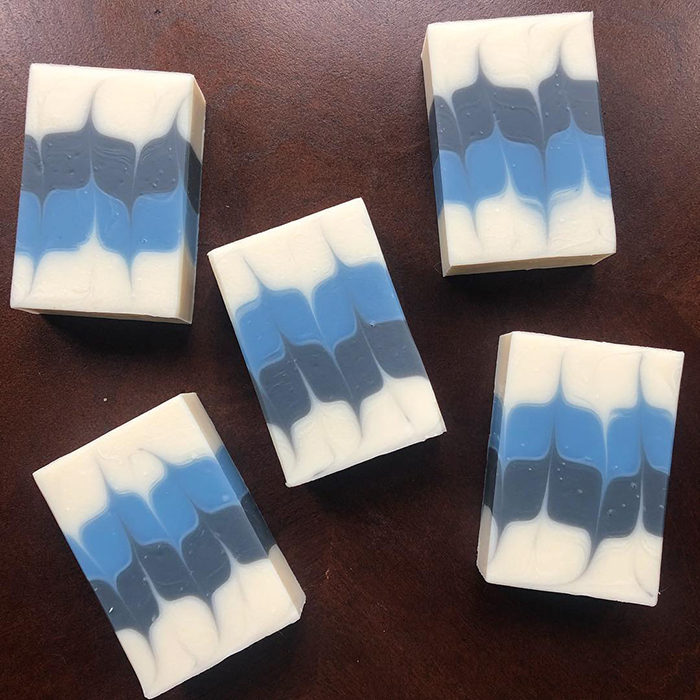 Honestly, I love being a part of the soapmaking community and interacting with amazing customers. I’ve been so impressed by the incredible amount of support, guidance, and encouragement that I’ve experienced over the last few years. 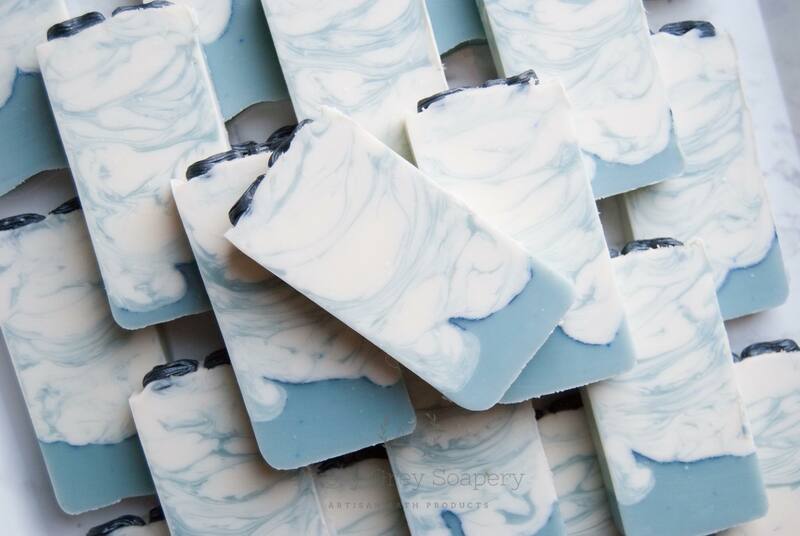 Artisan soap is a very saturated market, so I’m always pleasantly surprised by how many soapmakers are willing to share their techniques and help one another. I always encourage everyone to buy handmade items. You really help support a community of truly wonderful makers. Photo courtesy of Old Whaling Company. Photo by Leslie Ryan. 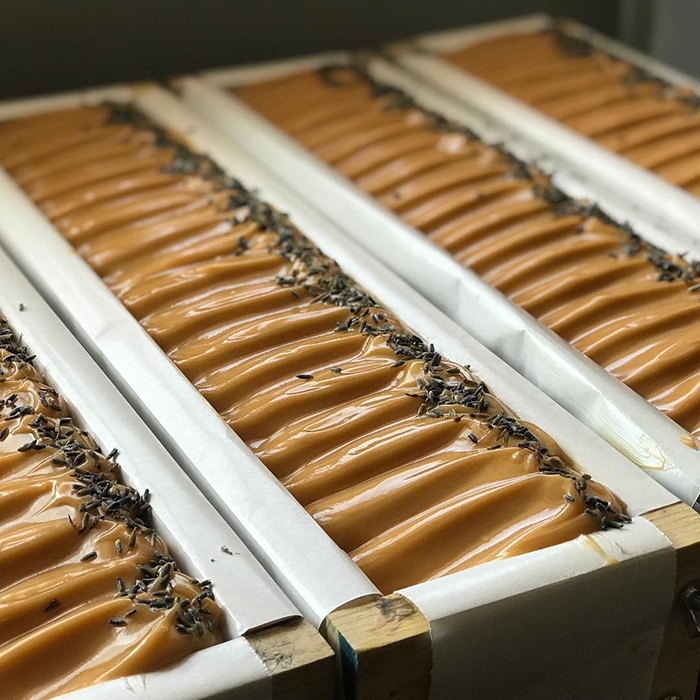 When you first start making soap, you’ll soon find you have more bars than you know what to do with. 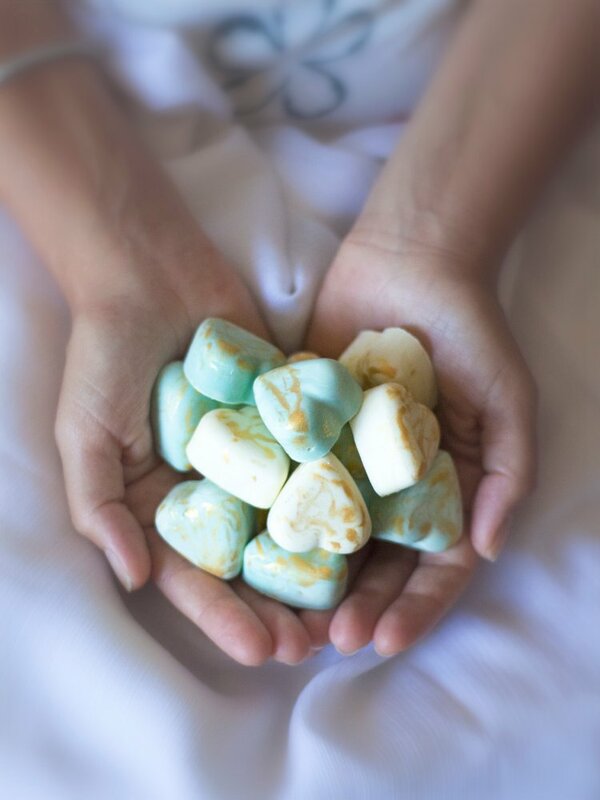 Many crafters give soap and other handmade products to friends and family. It’s pretty common for your loved ones to get hooked on those products and want more. Over time, people may ask about buying them. If that’s the case, selling your products is definitely something to consider. This post has more information on moving from hobby to business. 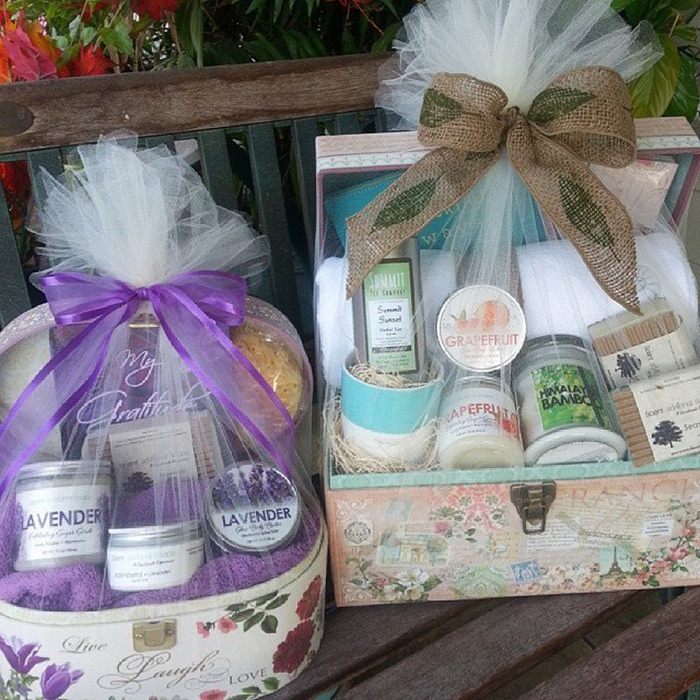 Local farmers markets, fairs and events are a popular place to sell handmade products. But how do you know if that’s the right path for you? First things first, markets take time, money and effort. 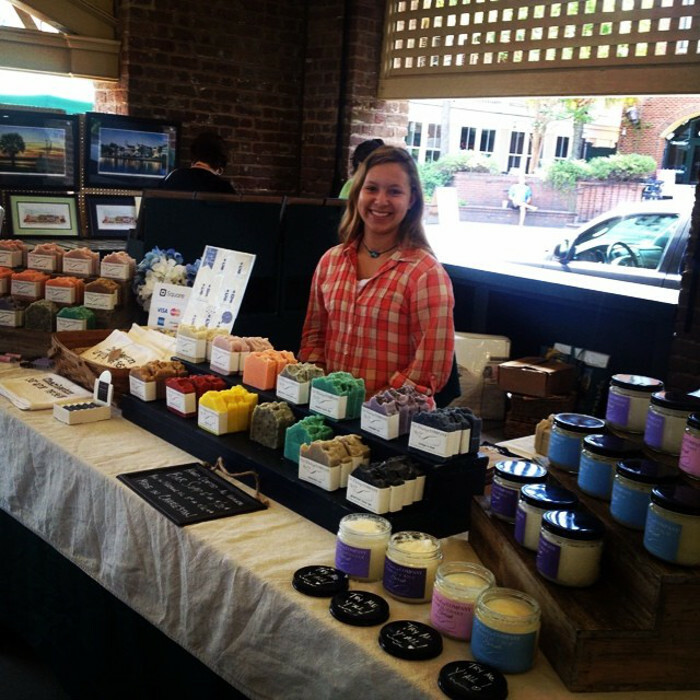 Lauren with Single Barrel Soaps said it’s a lot of work to sell your products at a market. She’s been selling soap for about two years and does at least one market a month. Read our interview with her here. That work includes making the products from scratch, packing them up and transporting them to the event. 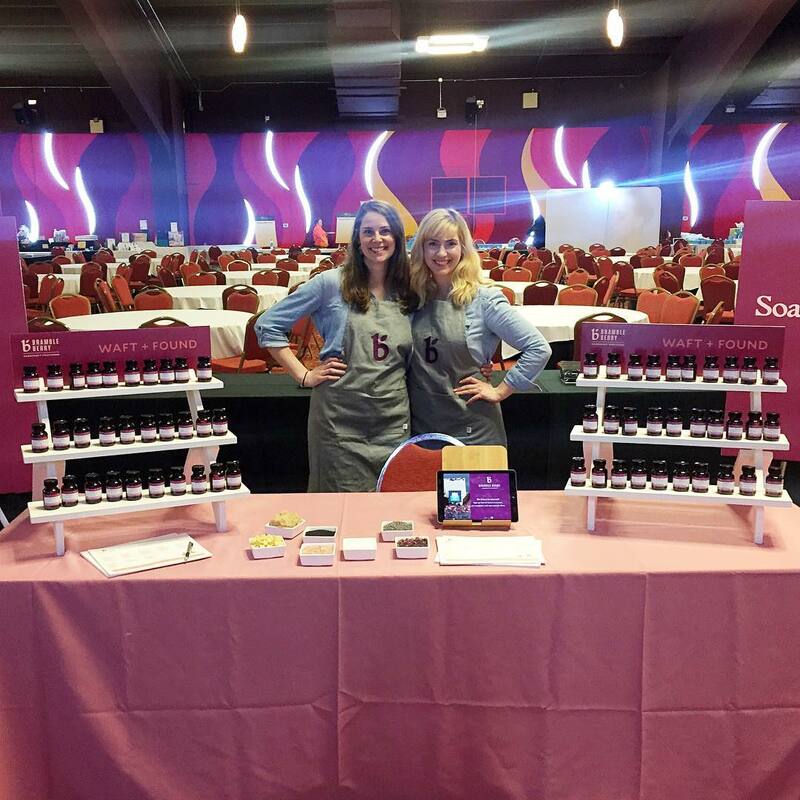 Once you’re at the event, you need to set up your booth or table and sell products for several hours. At the end of the event, you have to take the display down, pack it up and transport it back. It’s a full day of talking soap and selling products. Markets are also very social. April with Old Whaling Company said she talks about her products all day to multiple people. 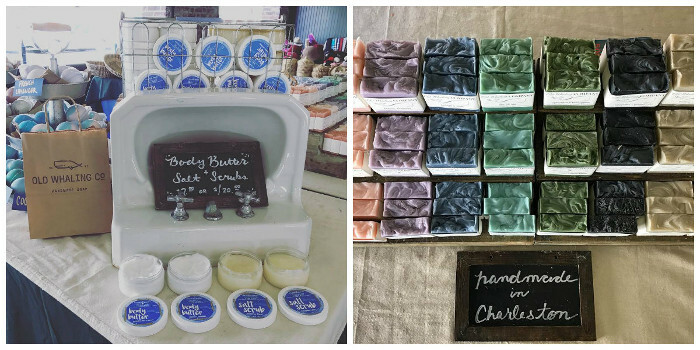 She started Old Whaling Company in 2012 and sells her products at the Charleston City Market every day of the week. People there are very curious about handmade soap. “You have to be ready to answer a lot of questions,” she said. Several of Old Whaling Company’s gorgeous market displays. There are definite advantages to selling your products at markets. You have a direct line to customers. You can talk to them about your products, how you carefully chose each ingredient and why they feel so amazing on the skin. The products aren’t made in a factory by a large company; they’re personally crafted by the person standing in front of them. 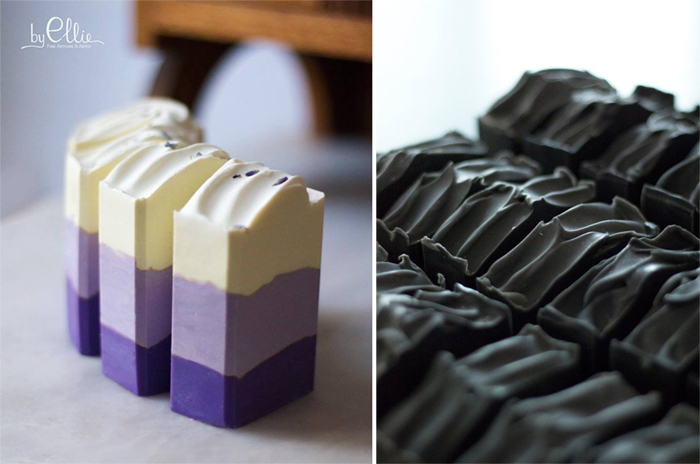 That’s one of the many advantages of handmade soap. Learn more advantages in this post. If selling at markets sounds like the right path for you, the next step is getting started. Deciding where to sell your products requires quite a bit of research. Start scoping out markets, fairs and events in your area. Once you find one that interests you, go see it in person! 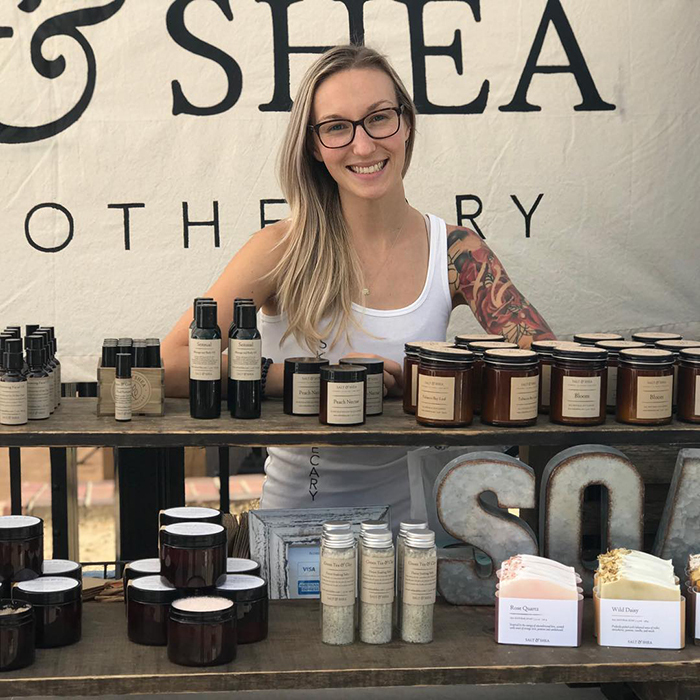 Lauren with Single Barrel Soaps recommends looking at the booths there, talking to vendors, talking to the organizers and buying products. Take note of how busy the market is. She also recommends paying close attention to booths that sell handmade soap and cosmetics. If you find your products are similar, you may want to reconsider what to bring. That way you don’t step on any toes, and you also stand out from other vendors. 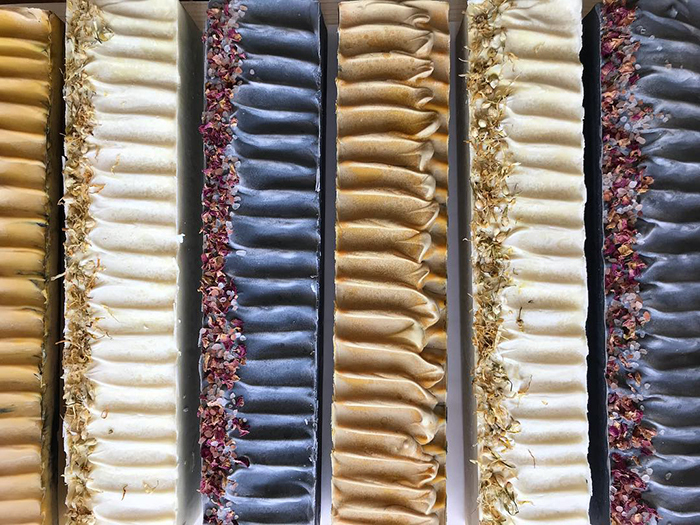 One of Single Barrel Soaps’ beautiful market displays. April with Old Whaling Company said event fees are something else to research. If they’re expensive and you’re just starting out, you may want to find a different event. Once you have a few markets under your belt and a loyal customer base, you can re-examine the larger and more expensive events. Once you decide on a market, the next step is figuring out what to bring. While you’re visiting the market, see if there’s a theme. Do you notice a lot of products with neon colors and fragrance, or do the products contain natural colors and essential oils? 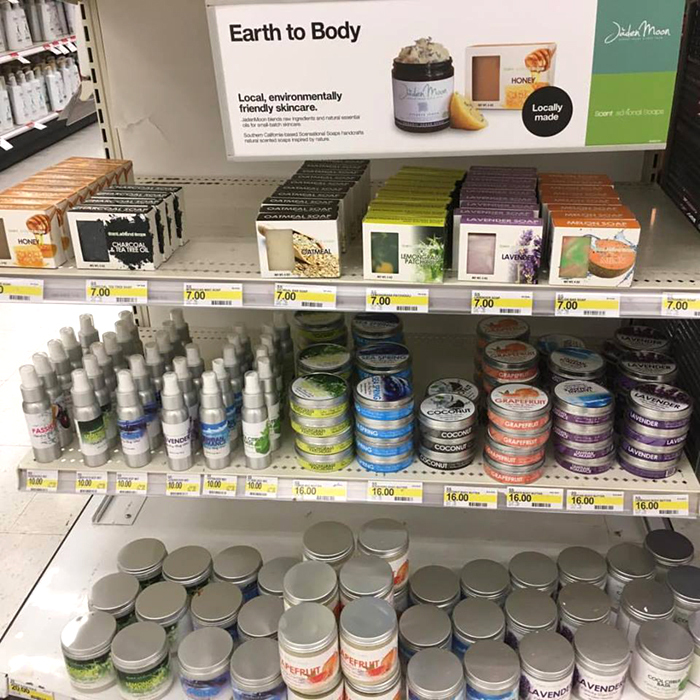 Is there a lot of soap, or are the vendors selling other products like lotion and scrubs? Don’t be afraid to take notes to help you remember. Tailoring your products to the shoppers can be really beneficial. For instance, when Lauren sold her products in Kentucky, the customers preferred fragrance oils. However, when she moved to Maryland, she found they preferred essential oils. She adjusted her product line to cater to those preferences. There is also something to be said for trial and error. When Jamie with Whitetail Lane Farm started going to events, she registered at local places and didn’t research each one. Over time, Jamie learned that fall shows are better for them than spring or summer shows, so she focused on those. You may find the opposite once you have a few markets under your belt. While you’re at the event, don’t be afraid to ask the shoppers plenty of questions. Do they prefer soap, or would they like to see bath bombs? What skin concerns do they have? What draws their eye? They can give you helpful tips so you know what to adjust or add for your next show. The more shows you do, the more you learn. That experience is extremely valuable and will help you be successful. Shopping is a psychological process. People tend to buy with their emotions and rationalize the choices later. That means attitude is incredibly important. A big smile and positive answers to questions can go a long way. If the event isn’t going like you planned, try to put a positive spin on it. 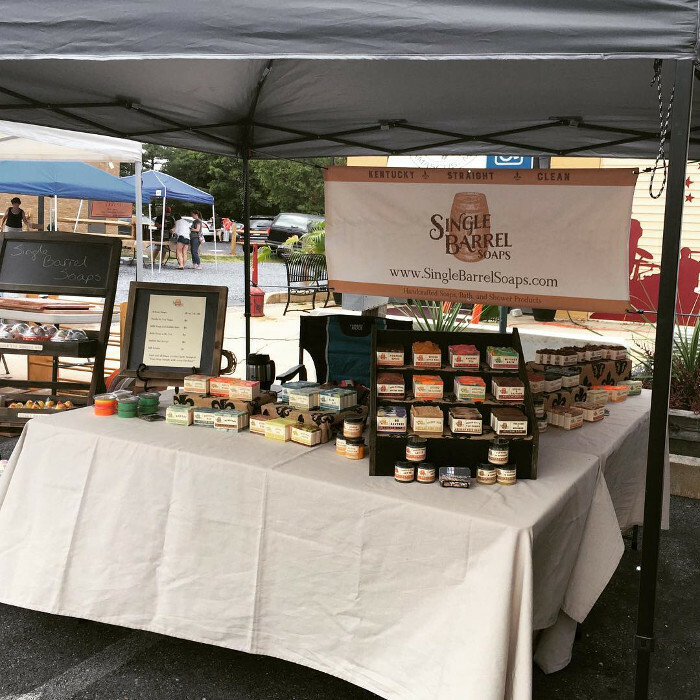 For instance, if people aren’t loving your products, you can say, “I’ve been getting great feedback on my products.” If the weather is too hot, rainy, etc., you can say, “It’s so awesome that people are here supporting small businesses even in this weather! I’m really thankful you’re here.” The positive answers really make a difference about how shoppers feel toward you and your products. Get more tips in this post. Lauren likes to stand for the entire event because it’s more inviting. Little details like what you’re wearing can also help you be successful. A clean and comfortable outfit is ideal for events. If you’re not sure what to wear, ask yourself if you’re comfortable going to a casual dinner in your outfit. If not, consider other options. The Selling Success at Fairs and Public Markets post has more helpful tips. April recommends bringing snacks and tons of water with you as well. Staying full and hydrated will keep your attitude and energy up. Hannah helping Old Whaling Company at the Charleston City Market. Notice the big smile and clean, comfortable outfit! Passion and knowledge about your products is important as well. 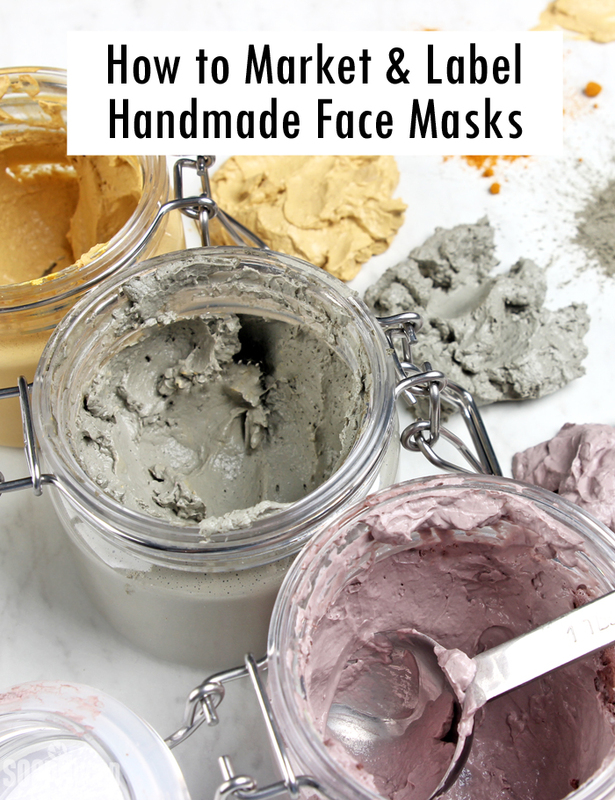 Make sure to highlight all the wonderful qualities of your handmade products and have answers ready when people ask about them. It’s also helpful to prepare answers for questions you may not feel comfortable answering. 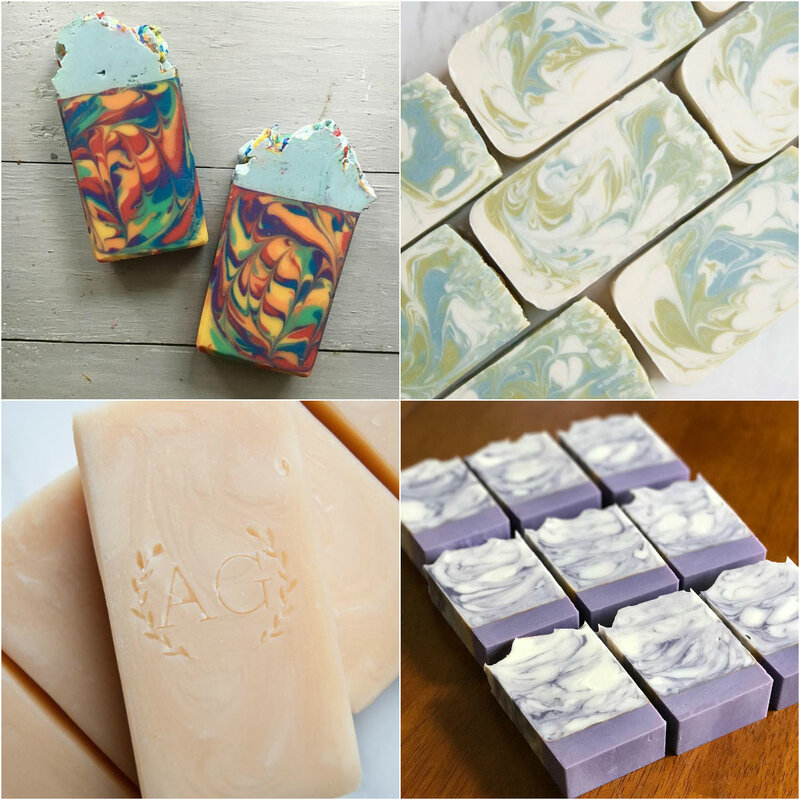 Some common topics include why handmade soap costs more than store bought bars, how you make your products, why they only use store bought soap, etc. This post has some common questions and suggested answers that still keep it positive. It also helps to emphasize your niche. Learn how to find your niche here. When shoppers ask about your products, focus on what makes your products stand out. 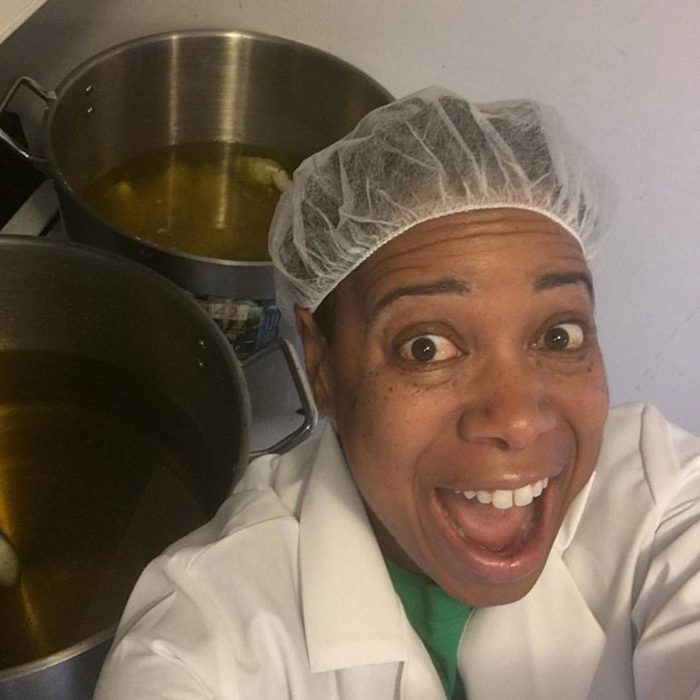 For instance, Jamie with Whitetail Lane Farm makes moisturizing soap with milk from her own herd of Nigerian Dwarf Goats. Her display features plenty of goat milk branding. 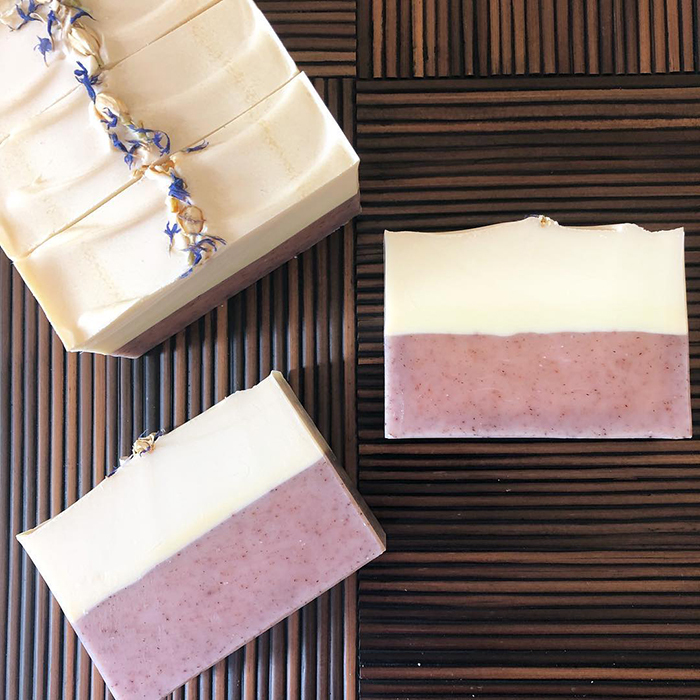 She is able to talk about the benefits of creamy goat milk soap, as well as the goats themselves. 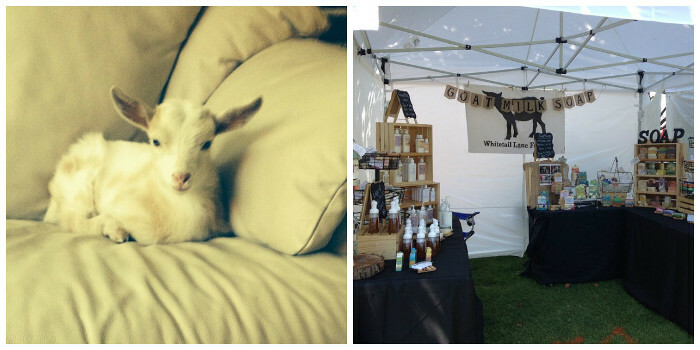 Jamie with Whitetail Lane Farm makes soap with milk from Nigerian Dwarf Goats. What are other selling options if markets aren’t for you? If selling at markets isn’t right for you, there are plenty of other options including selling online and in stores. The Where to Sell Products post has more information. Markets can be something you avoid altogether, or revisit at a later date. The most important thing is doing what’s right for you, your schedule and your business. What are your tips for selling at markets? 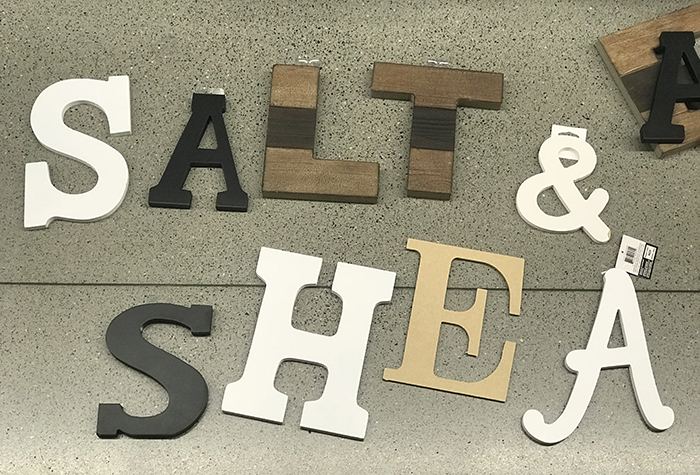 Check back later this month for a post on how to set up your display. Earlier this week, I attended the NY NOW Gift and Housewares Show in New York. The show is huge – as in, miles and miles of vendors. I walked over 4 miles just inside the showroom floor area. Because of its size, it’s held at the Jacob Javits Center. It’s a massive building in Manhattan that features beautiful walls of windows. It hosts a wide variety of events throughout the year, such as ComicCon, BroadwayCon and more. NY NOW is an event where exhibitors create booths to showcase their products to buyers. There were hundreds of booths to see (see the full list here). Some of the booths were small businesses, while others were well established brands such as Jonathan Adler and Kate Spade. 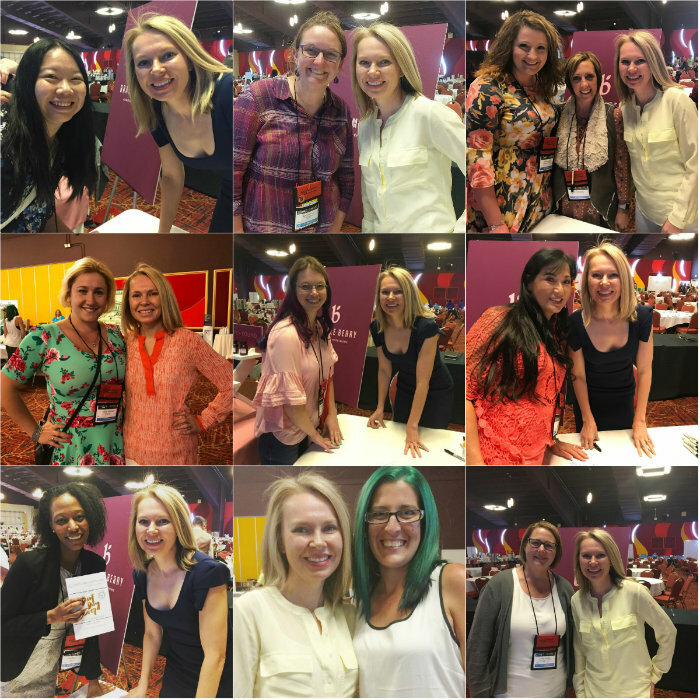 I went to the trade show with the mission to spot upcoming trends and gather inspiration. 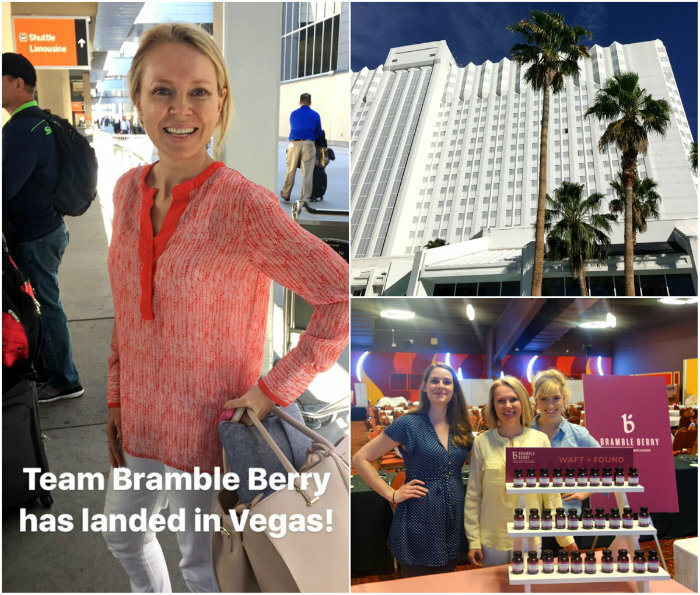 There were tons of amazing bath and beauty companies with incredibly beautiful products. The booths themselves were also pretty amazing – it takes a lot of work and creativity to get everything set up and looking good! There were so many booths and brands that caught my eye. Nancy of Bayberry Naturals (shown below) started her company when she was pregnant. Like many of us, she looked at the ingredients on her bottles and wanted something simple and less synthetic for her growing family. She is proud of her labeling because it clearly states what it does not have in the formulations (sulfates, parabens, phthalates, etc). Nancy said that she would get tired of buying something that was supposedly healthy, and then finding one or two ingredients that didn’t meet her stamp of approval. 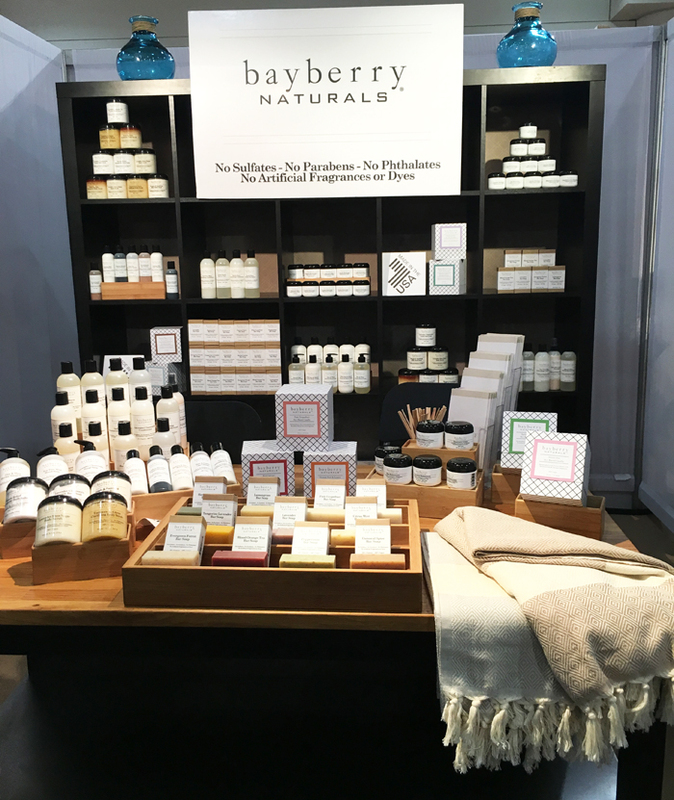 Bayberry Naturals was created out of the need for simple and natural bath and beauty products. 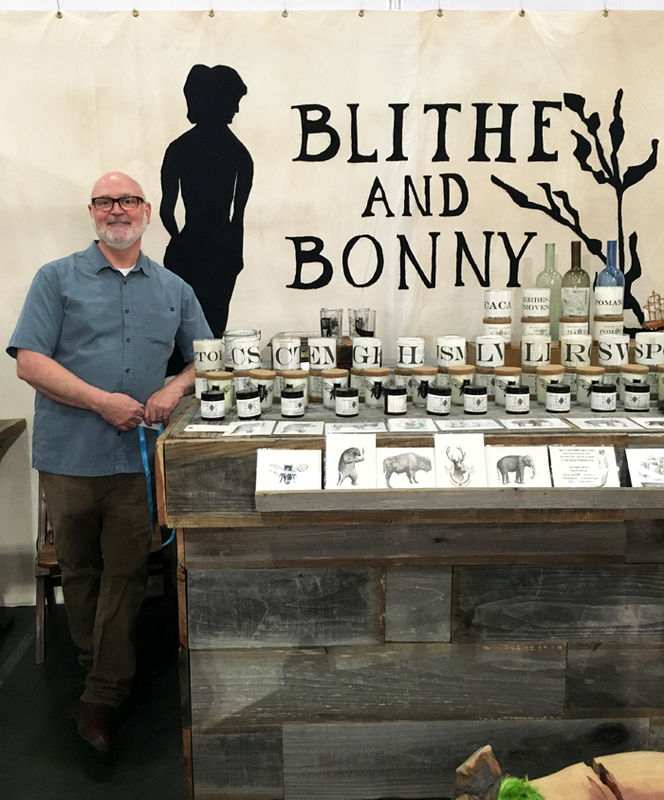 Blithe and Bonny was one of my favorite bath and body booths – and not just because David (shown below) was so down to earth, friendly and kind. I loved the story behind their name (inspired by a song in Shakespeare’s “Much Ado About Nothing”). I found that their commitment to quality was reflected beautifully in their packaging, their formulations and their product line. He also was so smart when it came to packing the booth – see that crate he’s leaning on? Everything that goes into their booth can fit into that crate for easy packing, set up and take down. Genius! 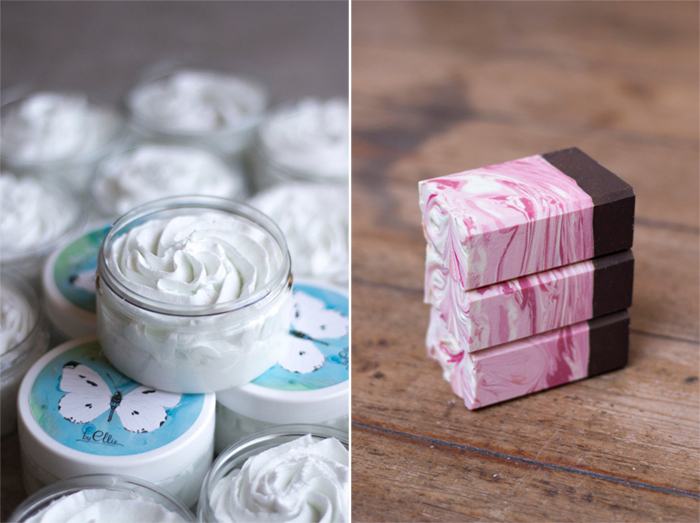 David of Blithe and Bonny showcases his gorgeous bath and beauty products. In addition to meeting business owners from around the country, I was happy to meet one of my favorite Seattle entrepreneurs, Moorea Seal (shown below). 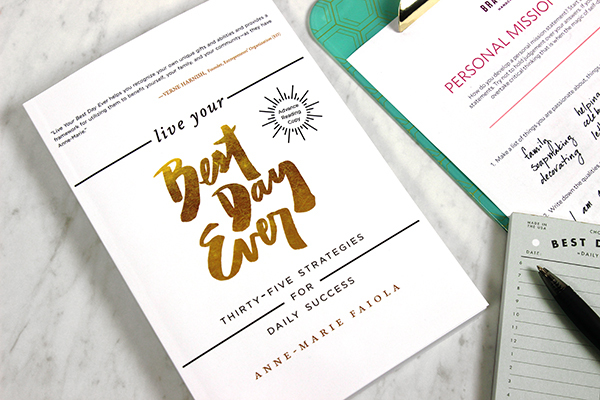 I got the chance to talk about her bold moves to get where she is in her business and her upcoming book, 52 Lists for Happiness (preorder it here!). I also caught up with Bellingham-based Flying Bird Botanicals (get some of their tea and thank me later) and Bellingham-based Bison Press (letterpress design company extraordinaire). 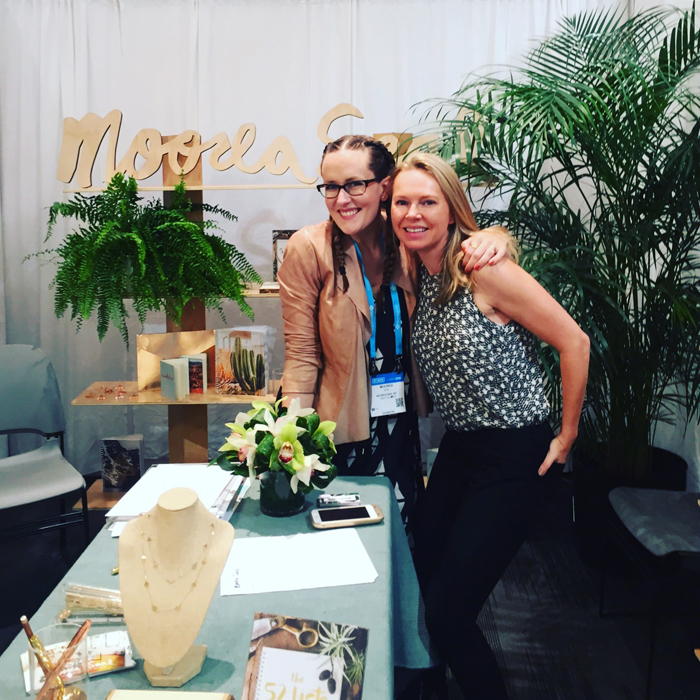 I love meeting other local entrepreneurs, so I was thrilled to meet Moorea Seal, who is based in Seattle. 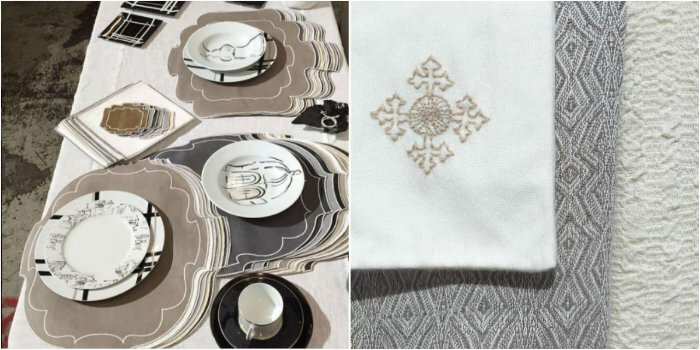 1) Metallic and Sacred Geometry: There were so many gorgeous examples of gold, bronze, silver and metallic in every single category – stationary, mugs, housewares, glassware, sheets, pillows, rugs, throws, scarves, jewelry. There was also a significant nod to geometric and symmetrical design. This was everywhere – on notebooks, socks, necklaces, USB drives, lights and office supplies. 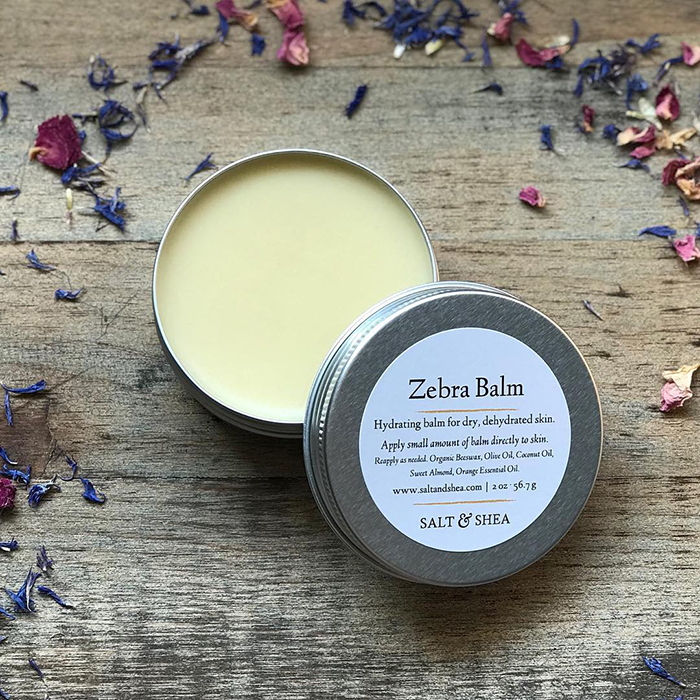 If you’d like to apply this trend to your bath and body products, think micas (like King’s Gold Mica and Pewter Silver Mica) dusted on top of soap or veins inside your soap. 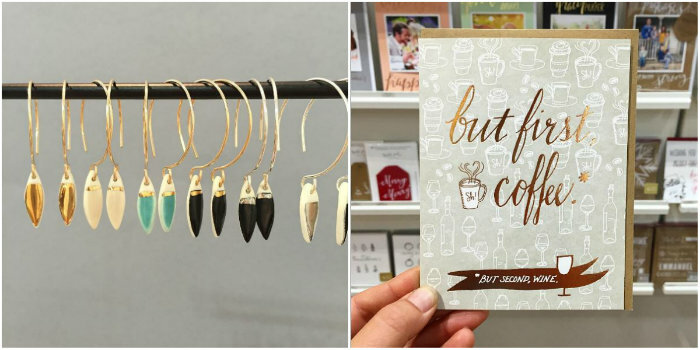 Or, on your packaging: a pop of metallic here and there, or metallic washi tape. Or, the metallic trend could apply to your fragrance choice. What does gold smell like to you? To me, a “gold” scent brings to mind Amber Fragrance Oil. 2) Neutrals and Texture: I’m not sure if it’s the chaos in the world that has driven this trend, but there were neutrals everywhere. Shades such as camel, taupe, gray, white, cream, ivory and blush dominated. In addition, there was gorgeous and sumptuous knitwear patterning everywhere (think Scandinavian sweaters and Mexican blankets). 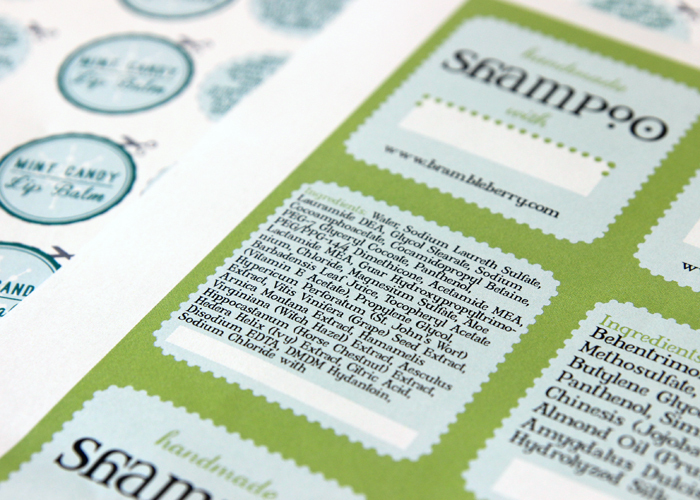 It was on letterpress cards, notebook covers, scarves, bedding, baby clothes, mugs and more. 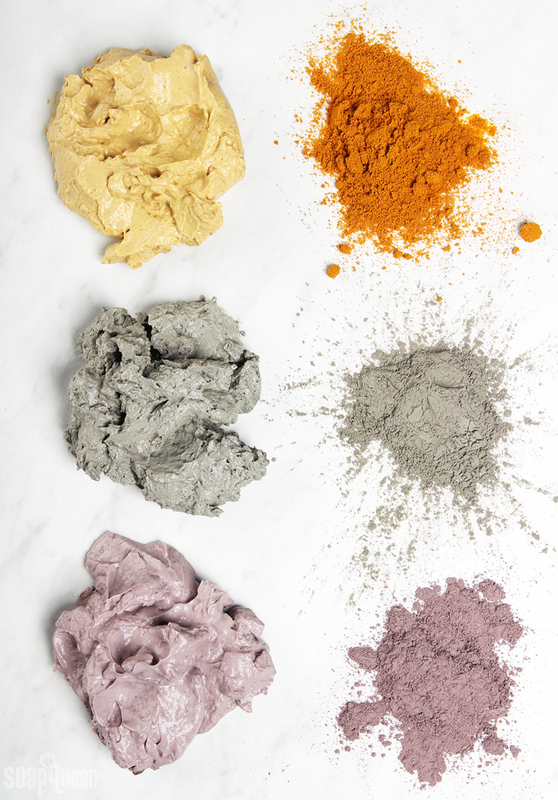 You can utilize the neutral trend in your bath and body products with color choices such activated charcoal and clays. If you jump on this trend soon enough, it lends itself well to simple (read: inexpensive) neutral packaging for your products. 3) Cutesy & Rainbow: While half of the show was embracing the calm in the midst of the storm, the other half was riding the wave in bright colors, patterning and rainbows. 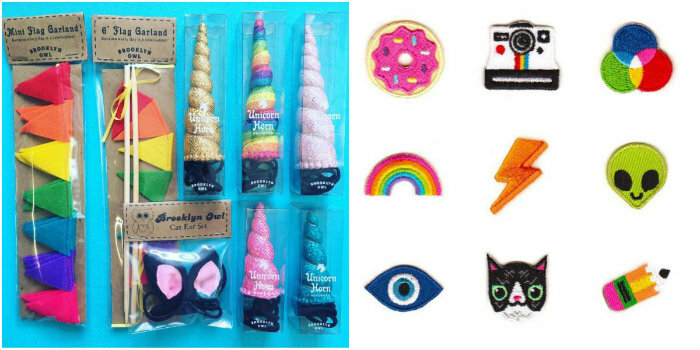 If it wasn’t adorable unicorns, it was rainbow walls of candles, crayons, adult coloring books, notebooks and more. There were also so many standout patterns done tastefully in tapestries, candle tins, bags, elaborate necklaces and jewelry. The way to embrace this trend as a bath and body manufacturer is with packaging and product designs in bright fun colors (might I suggest a Rainbow Sampler Pack?). Bright and happy fragrances (think Yuzu Fragrance Oil, Energy Fragrance Oil and Hello Sweet Thang Fragrance Oil) are another great way to jump on the trend. While in NYC, I didn’t skimp on my responsibilities to have the best time ever. 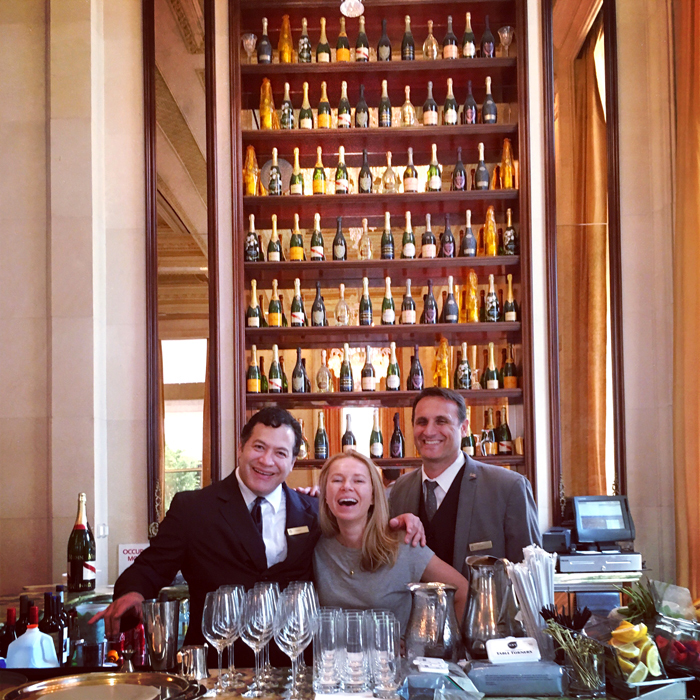 I had champagne at The Plaza, brunch at Tavern on the Green and dinner at the vaunted Tao. I fit a lot in! I was so exhausted when I got home. I averaged between 6 and 8 miles a day of walking (the city is big and the taxis are expensive y’all) and not a lot of sleeping. I’m so thankful for my team for holding it all down while I was gone. They’ve got some rockin’ ideas for our upcoming Soap Queen TV shoot and this week was all prep and testing. I can hardly wait to show you what we have in store. 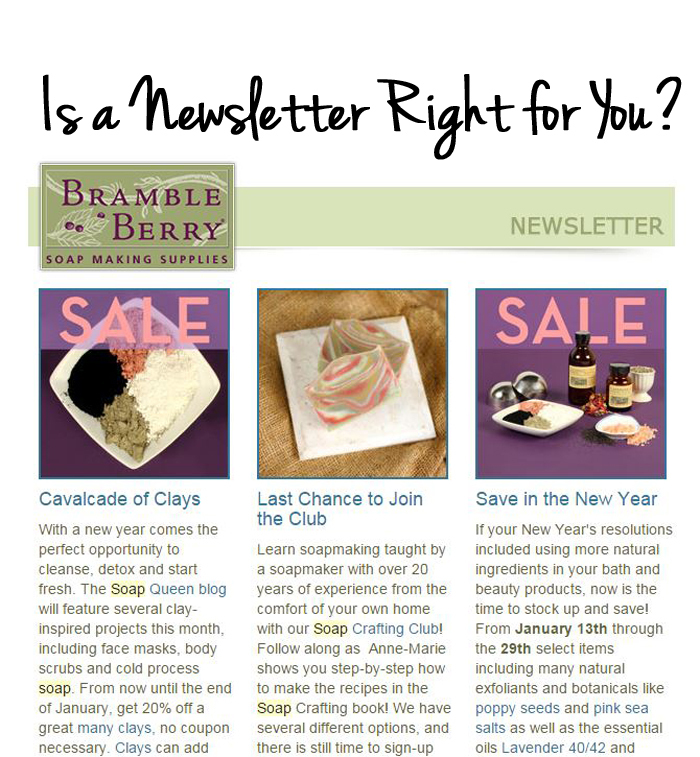 Is a Newsletter Right for You? In a marketing world highly influenced by new and emerging social media, a newsletter may seem like an old-school advertising method. The view of newsletter as old-fashioned is not unsubstantiated; newsletters are considered by some as the oldest news media, with ties going all the way back to the Roman Empire! With the help of technology and the internet, newsletters continue to be an extremely effective way to communicate information. And while newsletters often get overlooked in the age of social media, their strengths are not to be excluded. As I’ve said before in the blog post, Why a Newsletter is a Must, a newsletter is one of the few marketing bodies of work that you actually own.